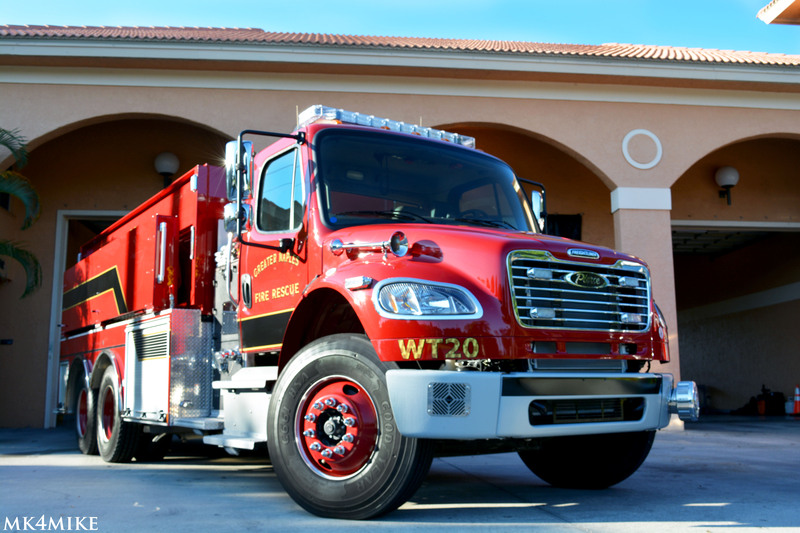 Engine 20 is a 2005 Emergency One Typhoon with a 1500 GPM pump and 750 gallons of water plus foam. It has a full compliment of extrication equipment and 1000 feet of 5 inch supply line hose. It is equipped with mobile data and a full aray of medical response gear including a heart monitor. This unit is a 24/7 Paramedic staffed unit. 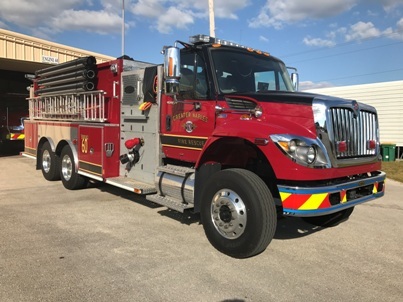 is a 2004 Ferrara Class A Pumper with a 1250 GPM pump and 750 gallons of water. 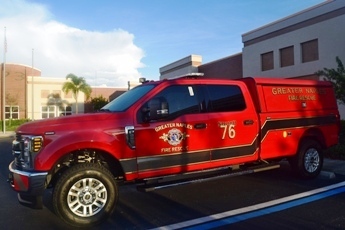 This vehicle carries a full compliment of extrication equipment and air bags with 1200 feet of 4 inch hose. It is also is equipped with a mobile data system including CAD and mapping information. Engine 22 also carries a full compliment of medical gear including an AED. 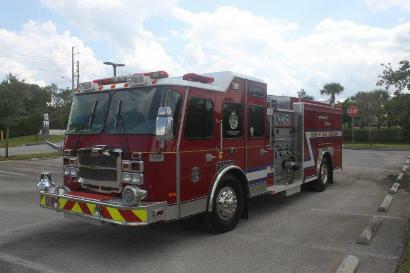 is a 2007 Ferrara Pumper with a 1250 GPM mid mount pump and 750 gallons of water. This vehicle carries a full compliment of extrication equipment and air bags and 1200 feet of 4 inch hose. It is also is equipped with a mobile data system including CAD and mapping information. Engine 23 also carries a full compliment of medical gear including an AED. 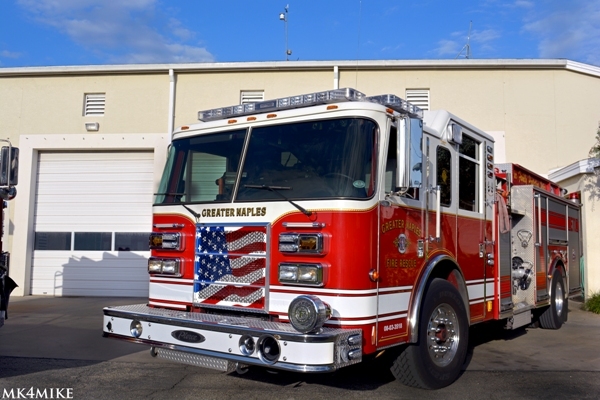 is a 2009 Ferrara Class A Pumper with a 1250 GPM mid mount pump and 750 gallons of water. 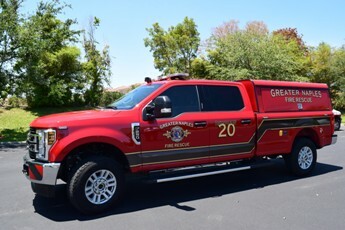 This vehicle carries a full compliment of extrication equipment and air bags with 1200 feet of 5 inch hose. It is also is equipped with a mobile data system including CAD and mapping information. Engine 24 also carries a full compliment of medical gear including an AED. 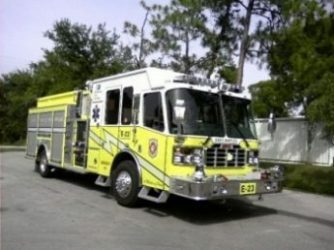 is a 2003 Pierce with a 1250 GPM pump and 500 gallons of water. It has a full compliment of extrication equipment and 1200 feet of 4 inch supply line hose. It is also equipped with mobile data and a full array of medical response gear including an AED. 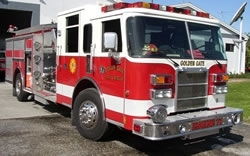 is a 1999 Pierce with a 1250 GPM pump and 750 gallons of water. It has a full compliment of extrication equipment and 1000 feet of 5 inch supply line hose. It is equipped with mobile data and a full array of medical response gear including AED. is a 2017 Emergency One Typhoon with A 1500 GPM pump and 1000 gallons of water plus foam. This vehicle carries a full complement of extrication equipment and air bags with 1000 feet of 5 inch hose. It is also equipped with a mobile date system including CAD and mapping information. 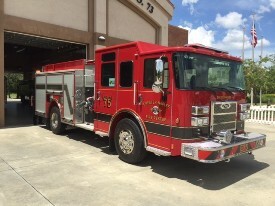 is a 2014 Pierce Saber with a 1250 GPM pump and 750 gallons of water. It has a full compliment of extrication equipment and 1000 feet of 5 inch supply line hose. It is equipped with mobile data and full array of medical response gear including an AED. is a 2005 Emergency One Typhoon with a 1500 GPM pump and 750 gallons of water plus foam. It has a full compliment of extrication equipment and 1000 feet of 5 inch supply line hose. It is equipped with mobile data and a full aray of medical response gear including a heart monitor. This unit is a 24/7 Paramedic staffed unit. 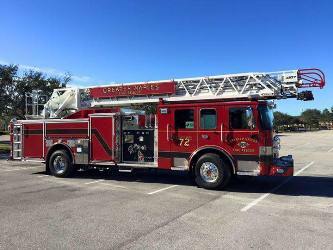 is a 2015 Pierce Quantum 75 ft. Aerial with a 2000 GPM pump and 500 gallons of water. It has a compliment of extrication equipment and 1000 feet of 5 inch supply line hose. It is equipped with mobile data and a full array of medical response gear including AED. 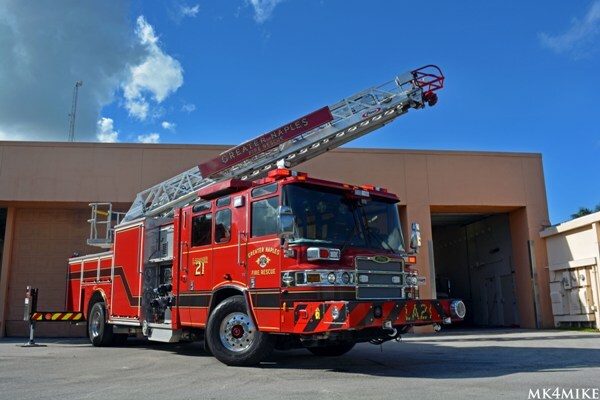 is a 2016 Pierce Enforcer 107 ft. Aerial with a 2000 GPM pump and 500 gallons of water. It has a full compliment of extrication equipment and 1000 feet of 5 inch supply line hose. It is equipped with mobile data and a full array of medical response gear including AED. is a 2018 REV Ford 250 equipped with a full size roll out command center. 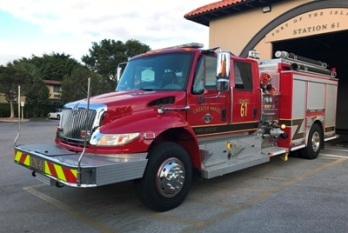 The vehicle is equipped with multiple VHF and UHF radios as well as a mobile data system for up to the minute CAD and emergency scene information. 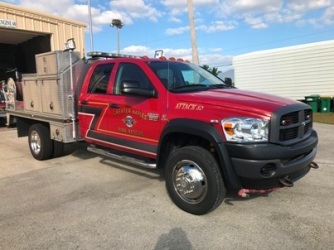 is a 1999 4×4 Dodge with a 250 GPM pump and 300 gallons of water. 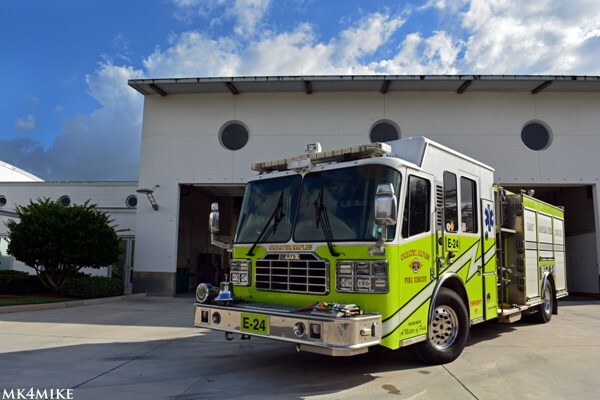 It is equipped with medical gear and wildland firefighting equipment. 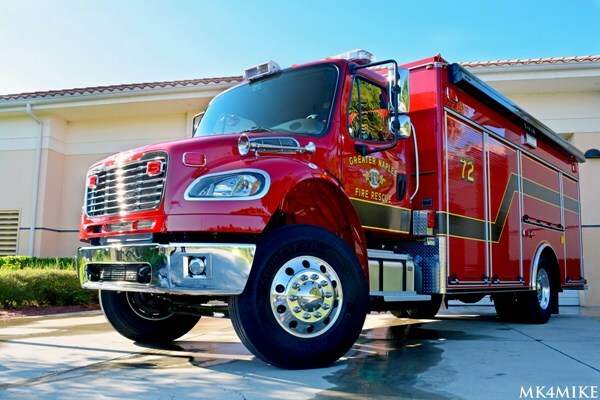 is a 2015 Pierce Freightliner 250 GPM pump and 2,000 gallons of water. is a 2015 Freightliner. It was fabricated by Rescue in Lake Park, Florida. It includes a 10K genterator, light tower, air compressor system and 40 spare air cylinder. 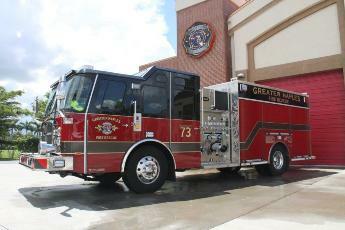 is a 2012 E-One International 1250 GPM pump and 2,500 gallons of water. is a 2006 Emergency One International with a 1250 GPM pump and 780 gallons of water plus foam. This vehicle carries a full complement of extrication equipment and air bags with 1000 feet of 5 inch hose. It also is equipped with a mobile data system including CAD and mapping information. 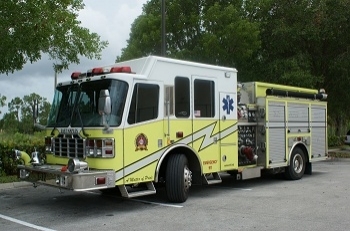 is a 2006 Emergency One International with a 1250 GPM pump and 780 gallons of water plus foam. This vehicle carries a full complement of extrication equipment and air bags with 1000 feet of 5 inch hose. It is also equipped with a mobile data system including CAD and mapping information. It is Advanced Life Support equipped. is a 2008 Ford F550. 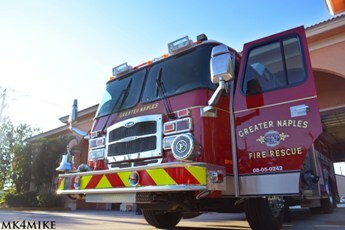 It is equipped with a 500 GPM fire pump, with 400 gallons of water and foam. 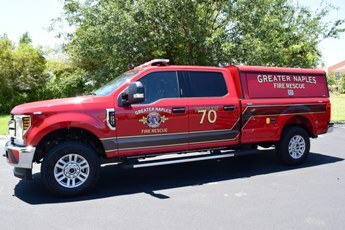 is a 2018 Ford F250, It was fabricated by REV Hallmark in Ocala, Florida. 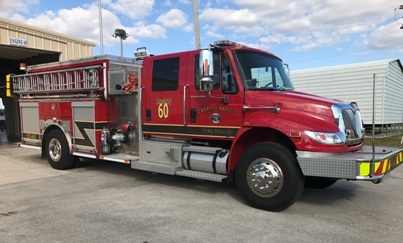 It includes a roll out tray that carries Advance Life Support (ALS )equipment, Self- Contained Breathing Apparatus (SCBA) and Basic equipment for firefighting. 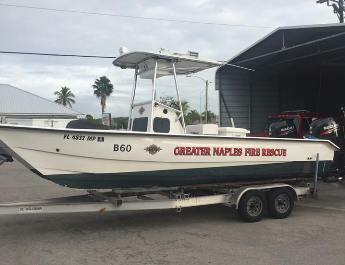 is a 2017 Metal Shark 36 Courageous aluminum Rescue Fire Boat. 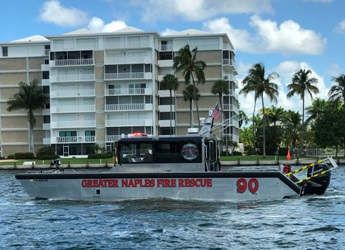 The vessel is capable of pumping 500 Gallons per minute of sea water for firefighting. It has advanced electronics for search and Rescue. The vessel is Advance Life Support (ALS) equipped and can transport a patient in an Air Conditioned pilot house. 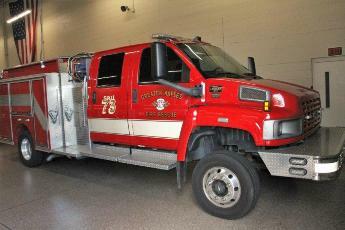 is a 26 ‘ Twin V. It is equipped with a fire pump and advanced life support equipment. It has GPS sonar and side scan for rescue purposes. 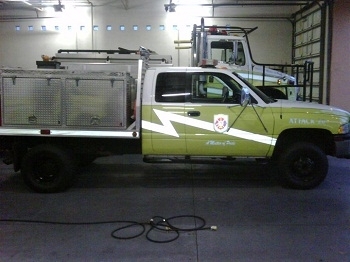 is a 2006 Chevrolet to deploy special equipment such as Urban Search and Rescue and Hazmat resources.